Our laboratory is studying the molecular mechanisms that modulate the formation, function and maintenance of synapses in the healthy and diseased mammalian brain. 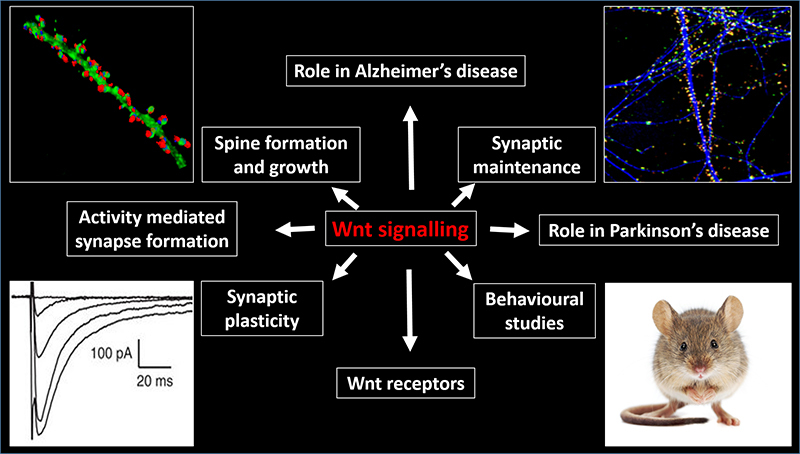 Our studies on Wnt signalling have led to the discovery that this prominent pathway promotes the formation and function of synapses in the hippocampus, an area implicated in learning and memory. Wnts also modulate synapse stability and function in this brain area and in the striatum, which control motor function. Our recent work led to the finding that dysfunction of Wnt signalling contributes to the pathogenic activity of Amyloid-ß at central synapses. To address the function of Wnts in the mammalian brain, we use a multidisciplinary approach that combines molecular, cellular, proteomic and genetic techniques together with high-resolution imaging, electrophysiology and behavioral studies. Our current work is focused on unravelling the molecular mechanisms by which Wnts modulate synaptic plasticity and memory, and how deficiency in this prominent signalling pathway contributes to synapse degeneration in neurodegenerative conditions such as Alzheimer’s and Parkinson’s diseases.